Philippine President Rodrigo Duterte offers China Telecom a slot to be the country’s third telecom provider. Duterte has repeatedly said he wanted to introduce a third player into the Philippine telecom industry to spur competition and improve service. It’s a concerted effort by President Duterte to shatter the stranglehold that PLDT and Globe Telecom has on the Philippines. And the crusty old expat is all for that, Mr. President. Unless another player is introduced onto the scene, PLDT (Smart) and Globe will continue to provide abysmal slipshod service. Under the watch of these two local companies, they “deliver” some of the slowest internet speeds in the world. Mr. Ma was being generous in his description. Presidential Spokesman Harry Roque acknowledged the offer was part of President Duterte’s efforts to improve ties between China and the Philippines. “It was brought up in bilateral negotiations between the Philippines and China. And the eventual player that was chosen by China, China Telecom, without doubt is one of the biggest in the world,” Roque said. However, though the Chinese government had nominated China Telecom for the license, the company said it had yet to decide if it would take up the offer. “China Telecom is currently having a preliminary study on the investment opportunity in Philippines and no concrete plan has been determined yet,” the company said in a statement to AFP News. Philippine law restricts a majority-foreign firm from the telecom industry, which means China Telecom would have to pick a local partner. Duterte has pursued closer economic, military and political ties with China for the Philippines, a traditional ally of the United States, since becoming president. He has reversed former president B.S. Aquino’s policy of challenging China’s expansionism in the South China Sea into waters also claimed by the Philippines. Duterte figures setting aside the territorial dispute could reap enormous economic benefits. 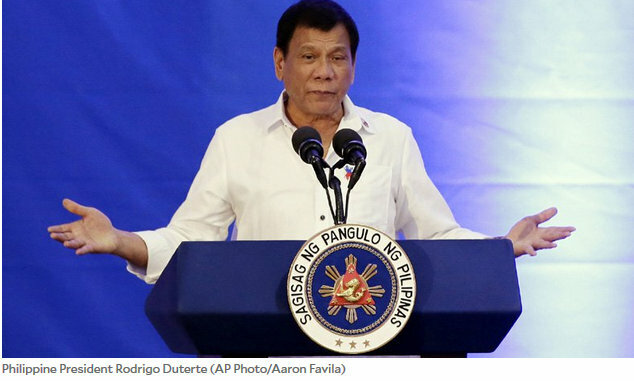 It’s the old adage, “if you can’t beat ‘em, join ‘em.” Duterte’s a realist, in my opinion. He realizes it doesn’t make any sense in going to a gunfight with a knife. However, there are concerns about corruption, with a similar Philippine-Chinese telecom venture ending badly a decade ago.